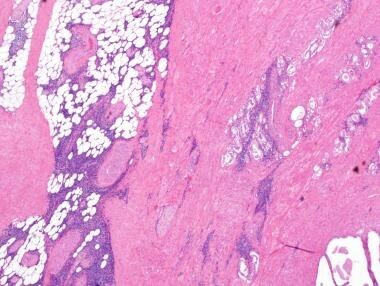 Prostatic involvement by lymphoma and leukemia is rare in surgical pathology practice. In the 2 largest consecutive series, leukemia/lymphoma was identified in less than 1% of prostates. Terris et al evaluated 1092 consecutive radical prostatectomy specimens, and pelvic lymph nodes if available, removed for prostatic adenocarcinoma. They found 1.2% of cases were involved by leukemia or lymphoma: 9 chronic lymphocytic leukemia/small lymphocytic lymphomas (CLL/SLLs), 3 Hodgkin lymphomas, and 1 hairy cell leukemia. In total, 0.8% (9 cases) demonstrated prostate and lymph node involvement, while 0.4% (4 cases) showed lymph node involvement only. Five (38.5%) patients had preoperative lymphocytosis. Similarly, Chu et al evaluated 4831 consecutive prostate specimens (3,405 biopsies, 266 transurethral resections, and 1,160 prostatectomies). They found that 15 (0.3%) cases demonstrated involvement by leukemia or lymphoma: 8 CLL/SLLs, 1 follicular lymphoma, 2 marginal-zone lymphomas, 2 mantle cell lymphomas, and 2 diffuse large B-cell lymphomas (DLBCLs). Combined, these studies suggest CLL/SLL is the most common type of leukemia/lymphoma to involve the prostate in routine specimens, and it is usually seen in association with involvement at different sites, particularly the pelvic lymph nodes. Primary prostatic lymphoma has been defined by the criteria of Bostwick and Mann, which include (1) symptoms attributable to prostatic enlargement, (2) prostate as the predominant site of involved, and (3) absence of involvement of liver, spleen, or lymph nodes within 1 month of diagnosis. Primary prostatic lymphoma is probably less common than secondary prostatic involvement, as the largest series to date consists of 22 cases, pulled from the archives of 3 major academic medical centers. The majority in this series (12 cases) were DLBCLs, with smaller numbers of SLL (4 cases), follicular lymphoma (4 cases), and Burkitt lymphoma (2 cases). As in other sites, chronic lymphocytic leukemia/small lymphocytic lymphoma (CLL/SLL) of the prostate histologically appears as expanses of monomorphic mature-appearing lymphocytes with round nuclear contours, condensed chromatin, and inconspicuous nucleoli. The infiltrate usually is patchy in distribution. Lymphoma cells may efface the prostate architecture and may extend outside of the prostate. 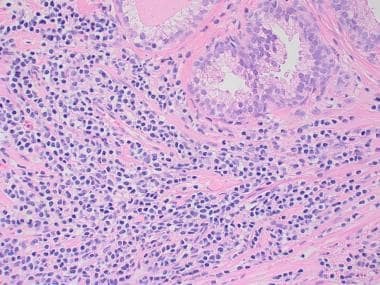 Tumor cells typically infiltrate the prostatic stroma in a nonperiglandular manner, and they may infiltrate between normal prostate glands. The typical immunophenotype is CD20+/CD10-/CD5+/cyclin D1-. 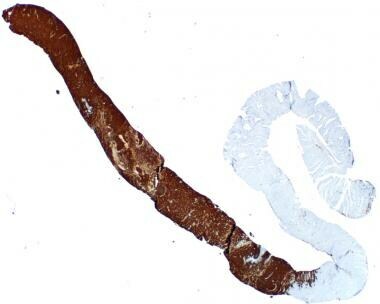 Light-chain restriction may be identifiable by immunohistochemistry. The primary differential diagnosis of CLL/SLL is benign chronic inflammation, which is very common in the prostate. In contrast to the monomorphic, expansive infiltrate of CLL/SLL, benign chronic inflammation is composed of a heterogeneous inflammatory cell population, which tends to be more limited in extent than lymphoma. Benign chronic inflammation is also preferentially periglandular, and thus it does not demonstrate the infiltrative growth in the prostatic stroma frequently observed in CLL/SLL. Chronic lymphocytic leukemia/small lymphocytic lymphoma (CLL/SLL) of the prostate. Lymphoma cells infiltrate the prostatic stroma in a nonperiglandular manner. Chronic lymphocytic leukemia/small lymphocytic lymphoma (CLL/SLL) of the prostate, high power. Lymphoid cells are monomorphic and low grade. Chronic lymphocytic leukemia/small lymphocytic lymphoma (CLL/SLL) involving the prostate. 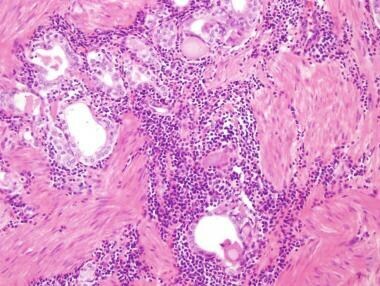 Lymphoma cells infiltrate between prostate glands, in a more subtle manner than in the above case. CLL/SLL also involved the pelvic lymph nodes in this patient. Chronic lymphocytic leukemia/small lymphocytic lymphoma (CLL/SLL) of the prostate, high power. 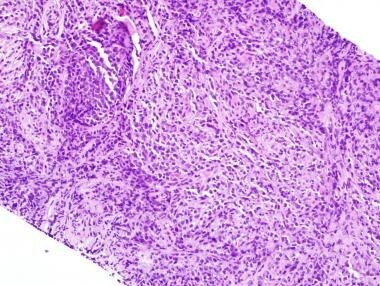 Lymphoma cells are monomorphic and low grade. 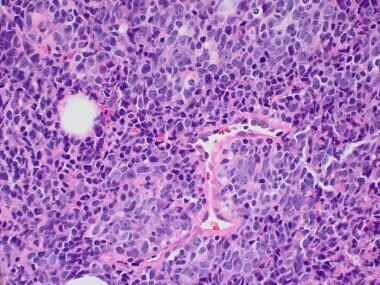 Diffuse large B-cell lymphoma (DLBCL) appears as an expansive proliferation of high-grade lymphoid cells with enlarged nuclei with vesicular chromatin. Mitotic activity is increased and apoptotic debris is common. Tumor cells often demonstrate destructive growth and extend beyond the prostate. They may also infiltrate between benign glands. Expression of CD45 and CD20 is seen, consistent with B-cell lineage. The main differential diagnosis of DLBCL is poorly differentiated carcinoma. DLBCL is CD45 positive and pan-cytokeratin negative in the great majority of cases, while prostatic adenocarcinoma and urothelial carcinoma are CD45 negative and pan-cytokeratin positive. Granulomatous prostatitis may also be in the differential diagnosis for DLBCL, as it demonstrates an expansive, destructive infiltrate of CD45-positive cells. The cells comprising granulomatous prostatitis are much less atypical than those of DLBCL, and they are CD68-positive histiocytes, while DLBCL is CD68 negative. Diffuse large B-cell lymphoma (DLBCL) of prostate, high power. Tumor cells are high grade with vesicular chromatin. CD20 immunostain of diffuse large B-cell lymphoma (DLBCL) of the prostate. 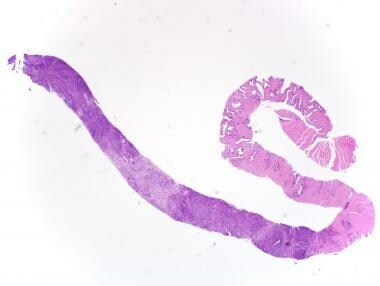 Diffuse large B-cell lymphoma (DLBCL) of the prostate on needle core. Gland destruction is evident even at low power. Diffuse large B-cell lymphoma (DLBCL) of the prostate on needle core. 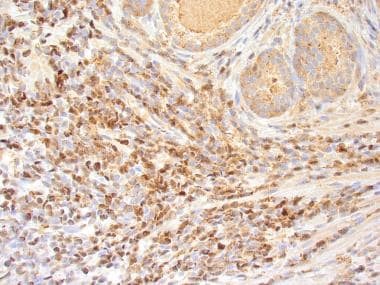 CD20 immunohistochemistry shows strong, diffuse expression in lymphoma cells. Diffuse large B-cell lymphoma (DLBCL) of the prostate, high power. Diffuse large B-cell lymphoma (DLBCL) of the prostate, high power. 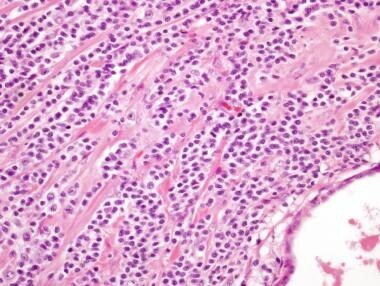 Lymphoma cells have high-grade nuclei. Apoptotic debris and mitotic figures are readily identified. 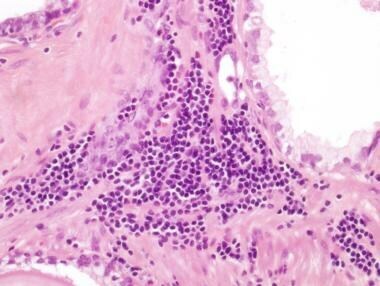 Mantle cell lymphoma typically appears as a proliferation of monomorphic small lymphocytes with irregular, angulated nuclei and inconspicuous nucleoli. Tumors cells grow in an expansive, infiltrative manner. The typical immunophenotype is CD20+/CD10-/CD5+/Cyclin D1+. Mantle cell lymphoma of the prostate. 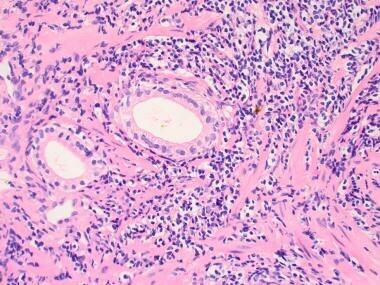 Tumor cells show an infiltrative pattern. 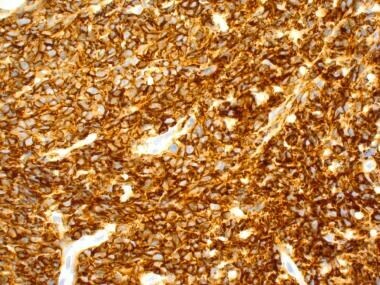 Cyclin D1 immunostain of mantle cell lymphoma of the prostate. 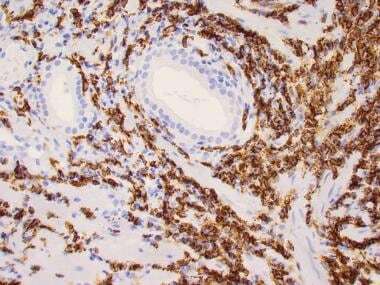 CD20 immunostain of a mantle cell lymphoma of prostate. 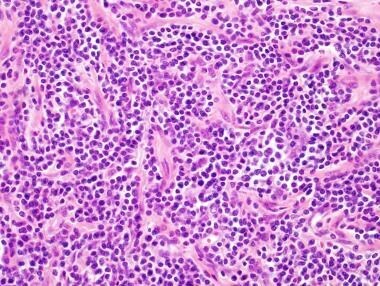 Marginal-zone lymphoma typically appears as an expansive, infiltrative proliferation of small- to medium-sized lymphocytes with variably smooth to irregular nuclear contours. Enlarged, higher-grade tumor cells resembling centroblasts are frequently seen, with increasing number associated with more aggressive tumor behavior. A subset of tumor cells may have the appearance of plasma cells. Associated benign chronic inflammation, including reactive non-neoplastic germinal cells, is common. As with other lymphomas, marginal-zone lymphomas grow in a destructive manner and may extend beyond the prostate. 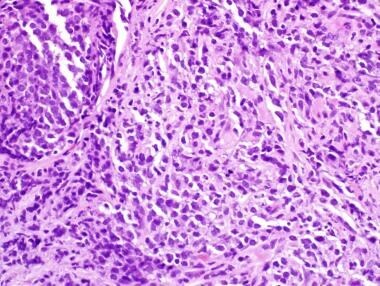 Lymphoepithelial lesions are a classic (but nonspecific) finding in marginal-zone lymphoma and consist of tumor cells infiltrating altered benign prostate glands. The typical immunophenotype is CD20+/CD10-/CD5-/cyclin D1-. CD43 may be expressed. Light-chain restriction may be seen, particularly when there is a plasmacytic component. Marginal-zone lymphoma of the prostate. 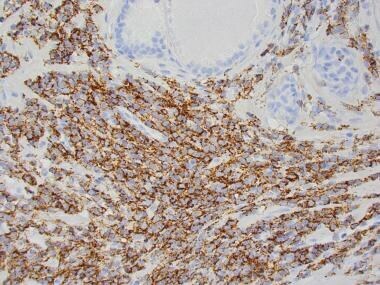 CD20 immunostain of marginal-zone lymphoma of the prostate. 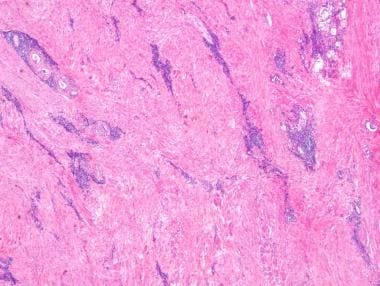 Marginal-zone lymphoma of the prostate, infiltrating the fibromuscular stroma (right) and extending into the extraprostatic soft tissue (left). 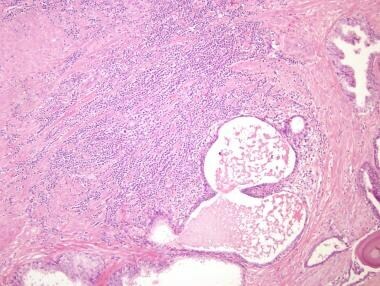 Prostatic adenocarcinoma is also present (right) and is involved by the lymphoma. Marginal-zone lymphoma of the prostate, infiltrating fibromuscular stroma in a nonperiglandular manner. 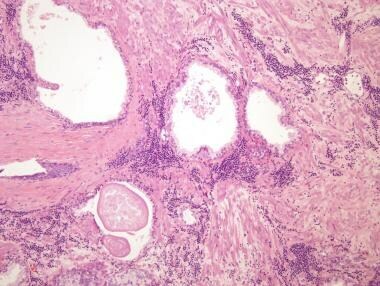 Marginal-zone lymphoma of the prostate involves a focus of prostatic adenocarcinoma. Marginal-zone lymphoma of the prostate, high power. Nuclei are monomorphic, small, and low grade. Leukemias and lymphomas are an extraordinarily diverse group of disease, with multiple subtypes with unique molecular findings. To date, no study has shown that leukemias and lymphomas of the prostate differ molecularly from analogous leukemias/lymphomas at other locations. As in other locations, prognosis in prostatic involvement by leukemia/lymphoma is dependent on the subtype. Terris MK, Hausdorff J, Freiha FS. Hematolymphoid malignancies diagnosed at the time of radical prostatectomy. J Urol. 1997 Oct. 158(4):1457-9. [Medline]. Chu PG, Huang Q, Weiss LM. Incidental and concurrent malignant lymphomas discovered at the time of prostatectomy and prostate biopsy: a study of 29 cases. Am J Surg Pathol. 2005 May. 29(5):693-9. [Medline]. Bostwick DG, Mann RB. Malignant lymphomas involving the prostate. A study of 13 cases. Cancer. 1985 Dec 15. 56(12):2932-8. [Medline]. Bostwick DG, Iczkowski KA, Amin MB, Discigil G, Osborne B. Malignant lymphoma involving the prostate: report of 62 cases. Cancer. 1998 Aug 15. 83(4):732-8. [Medline]. The author would like to acknowledge Scott Owens, MD, Associate Professor, Department of Pathology, University of Michigan Medical School, for his review and feedback on this article.